In 2015, WhatsApp introduced voice calling WhatsApp Voice Call: Everything You Need to Know WhatsApp Voice Call: Everything You Need to Know Popular instant messaging app WhatsApp has finally launched a new voice calling service, enabling users to make phone calls over the Internet. Read More , enabling users to voice call other WhatsApp users. 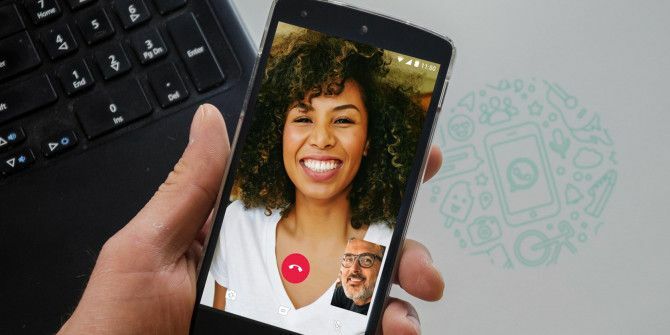 Then, in 2016, WhatsApp introduced video calling WhatsApp Video Calling Guide: Everything You Need to Know WhatsApp Video Calling Guide: Everything You Need to Know WhatsApp video calling enables user-to-user video chat. We cover everything you need to know about communicating over live video. Read More , enabling users to video call other WhatsApp users. Now, WhatsApp is introducing group calling for voice and video. Group video calling also coming to WhatsApp. Pretty soon Facebook is going to have four apps—Facebook, Messenger, Instagram, WhatsApp—that are absolutely exactly the same thing. Other messaging apps have offered group voice calls and videos chats for a while now. Even Snapchat joined the party in April 2018 Snapchat Adds Group Video Chats and Voice Calls Snapchat Adds Group Video Chats and Voice Calls Snapchat is rolling out group video chats and group voice calls. This allows you to video chat with up to 16 people, or voice chat with up to 32 people. Read More , with support for voice calls for up to 32 people, and video calls for up to 16 people. But it’s better late than never for WhatsApp. WhatsApp’s group calling for voice and video supports up to four people in total. All you need to do is start a one-on-one voice or video call with someone, and then tap the “Add participant” button in the top right corner to invite someone else to the conversation. Two things separate WhatsApp’s group calls from the competition. First, all group calls are end-to-end encrypted. Which is probably why they’re limited to just four people. Secondly, WhatsApp has designed group calls to work under a variety of network conditions. WhatsApp is currently rolling out group calling to its Android and iOS apps. So, be sure to keep your WhatsApp updated to the latest version in order to gain access to the feature. With more than 1.5 billion people using WhatsApp, that’s a lot of people to group call. If you’ve read this far down we assume you’re a regular WhatsApp user. Which means you should check out these tips to make WhatsApp more secure and private. But if you’re new to WhatsApp, take a look at the best WhatsApp features everyone should know 10 Best WhatsApp Features Everyone Must Know 10 Best WhatsApp Features Everyone Must Know Want to get the most out of WhatsApp? Some features -- hidden and obvious, new and old -- are essential to improving your experience. Here are some of the best. Read More . Explore more about: Video Chat / Call, WhatsApp.